After all my talk about how I was going to bravely sally forth and travel alone through Spain, I am only truly alone after three and a half weeks of travel. 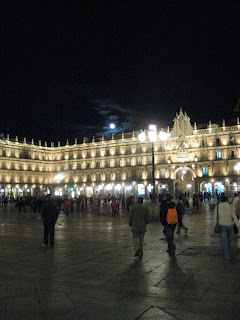 I’d been lucky to have Anne for Madrid and Barcelona, Becca for Andalucia, and I noticed their absence sharply when I stepped off the 8-hour bus from Sevilla into the city of Salamanca. I arrived at the Pension Lisboa, a small cheap hotel selected by Lonely Planet, and I immediately wondered why it had been picked out of the myriad, small, cheap hotels in the city. The best I can say about it is that it was clean, which is an important attribute to be sure, but it didn’t totally balance out the hideous polyester floral bedspread. I felt like I had come to a guesthouse for genteel women fallen on hard times to come, live out their days and die. I wasn’t really unhappy, though. I spent the first afternoon just sitting in the sun on the steps of the Colegio de Anaya of the Universidad de Salamanca, looking at the cathedral across the plaza but not really in any hurry to go inside. I wandered around the commercial district, buying a hat and gloves to protect me from the cold of Castilla y León, a brutal shock after sunny Sevilla. I walked through “the most beautiful Plaza Mayor in Spain.” I poked through the old building of the famous university and tried to find the good luck frog on the façade. I wandered through a pretty garden, unmarked on my map, and ate two kinds of buñuelos, little donuts filled with whipped cream or chocolate or buttercream, what have you. And I survived my first dinner alone in Spain. I even enjoyed it. I wandered around for awhile looking for a place where I wouldn’t feel too inconspicuous. I’d had lunch in Barcelona alone, but even super-social Spaniards eat lunch alone once in awhile, and I never felt like an oddity. But dinner was more challenging. I didn’t want to go into a bustling tapas bar filled with people laughing and jostling each other while holding drinks in their hands. I didn’t want to go into a desolate tapas bar with only old men who know each other from 50 years ago. I picked a sit-down restaurant, Rúa Mayor near the Plaza Mayor, because there was already one elderly woman tourist eating there alone. Thinking about the intrepid women who traveled alone in times when that was really weird gave me courage, that and the thought that I could soon have a glass of wine. I started with the pimientos rellenos, the red peppers stuffed with potato, a bit of cod, and tiny shrimp, baked in an earthenware dish with a tomato sauce and cream. It had been run order the broiler, and the top was very attractive, brown and crispy. 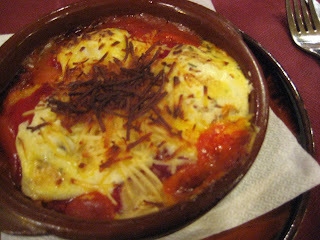 The potatoes were so smooth, they tasted almost cheesy, and the tomato sauce was sweet and rich. It came out very hot and I could feel myself getting happier and happier. 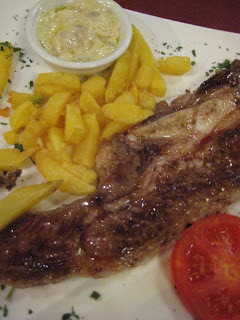 My entrée was simpler, churrasco de la ternera a la parilla, or a piece of grilled beef rib. It came crispy French fries and a mushroom sauce. It had a fair amount of gristle, but it was exactly what I wanted, something satisfying and simple. Since I had no one to talk to, I talked to myself by writing in my journal and jotting notes about my meal. In a way, that satisfied me more than anything, to be writing again. I knew that I could have asked Becca or Anne for some time to write, but I had had to gorge myself on their company, like a bear preparing to hibernate. And I hopefully now had sufficient fat stored up to survive the rest of my solo trip. By that point, the wine and food had made me woozy. I’d stuffed myself, since I’d only eaten Gummi bears and Maria biscuits all day. I was glad that the Pension Lisboa was so close. As I stumbled home and fell into my bed, I didn’t even notice the ugly bedspread.